Hydraulic and pneumatic mechanisms I.
doc. Ing. Josef Cerha, CSc. The first part of the text is devoted to energy transfer in hydraulic and pneumatic mechanisms, basic laws that apply in the transfer of energy and their interpretation referring to the electro-hydraulic analogies. The reader will get acquainted with the basic terms and quantities that make it easier to understand the principle of operation of fluid mechanisms, their parts and some contexts and, last not least, their quantitative and qualitative assessment. A whole series of paragraphs in Chapter 3 can be seen as examples, which make use of knowledge of fluid mechanics and thermomechanics. 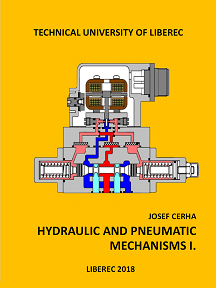 Hydraulic mechanisms are discussed in the second part of the textbook. The fourth chapter is devoted to power, control, and other elements: fluids, filtration and filters, connectors, etc. For the above reasons and also because the company literature in this sense is very rich, the interpretation is conceived more or less in an encyclopedic manner, with emphasis placed on the principle of operation, mathematical description, basic (catalogue) data, static characteristics, attractive designs and applications. The fifth chapter discusses the control of parameters of the power transmitted. The sources of pressure fluids, pressure and flow control or force control or torque control, control of movement frequency, the change in direction of motion and stop of motors with reference to typical designs of circuits with conventional as well as proportional elements linked to control systems.